The Attorney General of Maryland and Delaware are asking Google and Apple to discontinue applications for their mobile phones, the Android and iPhone respectfully, that show the location of DUI checkpoints, according to wmal.com. Blackberry pulled its drunk driving checkpoint location application, PhantomALERT; however, many apps are still available through Google and Apple for a small fee, such as Checkpointer, Buzzed, and Checkpoint Wingman, (which also offers a free version). There is nothing illegal about publishing this information. In fact, Ingersoll v. Palmer provided the criteria for law enforcement to follow to ensure the constitutionality of a DUI checkpoint. One such requirement was advanced publicity. People v. Banks has since stated that advanced publicity is not a requirement but one factor to be considered along with the other seven criteria. 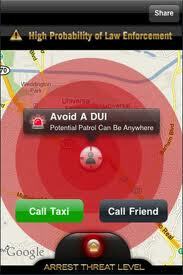 Therefore, these apps can actually assist law enforcement by providing such public notice. It should also be noted that it is not illegal to avoid a roadblock. Law enforcement cannot lawfully stop a driver for going around a checkpoint as long as the driver is not doing anything unlawful or showing obvious signs of impairment.